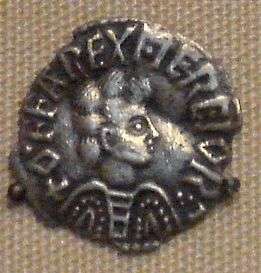 Burgred (also Burhred or Burghred) was an Anglo-Saxon king of Mercia from 852 to 874. 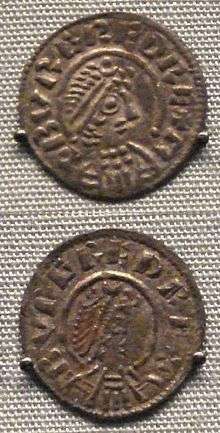 Burgred became king of Mercia in 852, and may have been related to his predecessor Beorhtwulf. After Easter in 853, Burgred married Æthelswith, daughter of Æthelwulf, king of the West Saxons. The marriage was celebrated at the royal villa of Chippenham in Wessex. In 853 Burgred sent messengers to Æthelwulf, king of the West Saxons, to help him subjugate the Welsh, who lived between Mercia and the western sea (Irish Sea), as they were rebelling against his rule. Immediately King Æthelwulf moved his army and advanced with Burgred against the Welsh. They invaded and placed them under subjection to Burgred. Twelve years after Burgred's success against the Welsh, in 865, the Great Heathen Army arrived. Following its successful campaigns against East Anglia and Northumbria it advanced through Mercia, arriving in Nottingham in 867. Burgred then appealed to his step-brothers King Ethelred of Wessex and Alfred for assistance against them. The armies of Wessex and Mercia did no serious fighting as Burgred paid them off. In 874 the march of the Vikings from Lindsey to Repton drove Burgred from his kingdom after they sacked Tamworth. After Burgred left, the Vikings appointed a Mercian Ceolwulf to replace him, demanding oaths of loyalty to them. Burgred retired to Rome and died there. He was buried, according to the Anglo-Saxon Chronicle, "in the church of Sancta Maria, in the school of the English nation" (now Santo Spirito in Sassia) in Rome. Single coins from the reign of Burgred continue to be found but Burgred coins within hoards are less common.In 1998 a hoard with Burgred coins was found by the Birmingham University Field Archaeology Unit near Banbury Castle. In December, 2003, silver Burgred coins were found at a site in Yorkshire, which may be the first actual Viking ship burial in England proper. ↑ Ann Williams; Alfred P. Smyth; D. P. Kirby (1991). A Biographical Dictionary of Dark Age Britain: England, Scotland, and Wales, C. 500-c. 1050. Psychology Press. pp. 68–69. ISBN 978-1-85264-047-7. 1 2 Dr Rory Naismith; Dr Martin Allen; Dr Elina Screen (28 December 2014). Early Medieval Monetary History: Studies in Memory of Mark Blackburn. Ashgate Publishing, Ltd. p. 409. ISBN 978-1-4094-5668-1. Wikisource has the text of the 1911 Encyclopædia Britannica article Burgred.